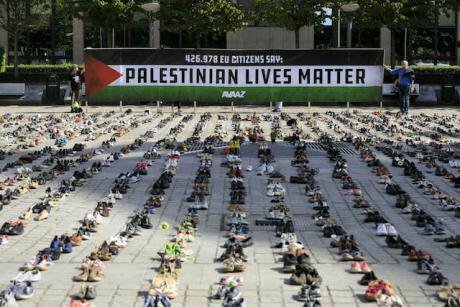 From a protest in Brussels to memorialize those killed in Gaza. Picture by Monasse Thierry/ANDBZ/ABACA/ABACA/PA Images. All rights reserved. Recent disturbing images from the Gaza border have created a terrible anguish in the public’s imagination, as Palestinian men and women, young and old, headed to the Israeli border. The protest campaign, ‘The Great March of Return’, declared the right of Palestinian refugees to return to the land they were forced to flee in 1948. At least 118 protestors were killed, as Israeli soldiers fired on the crowds using live ammunition, tear gas and rubber bullets. The question now is not only how to respond to recent conflict on the border, but to address the underlying causes that produced these disturbing events. The head of the Israeli military had warned that conditions in Gaza were so severe they were likely to implode. Little attention was paid, and decisions made in air-conditioned offices in Jerusalem were totally disconnected from the desperation of Palestinian lives. Politicians at the top echelons of power chose to keep their heads in the sand. Palestinians face ecological and humanitarian disaster. A special UN report issued in September 2015 warned that by 2020, the Gaza Strip could become uninhabitable, stemming from a decade siege by Israel and Egypt. Unemployment is at 44%, the water is undrinkable and raw sewage pours into the sea. More recently, President Abbas has imposed sanctions on Gaza halting the shipment of medicines and cutting payment for electricity. Many parties are implicated, and the resistant politics of the Hamas government prevents easy solutions. The young Gazan people protesting have been exposed to three wars in less than a decade and have become desperate enough to risk their lives because they believe they have no chance for something better. There is a danger of nihilism pervading the culture, as the young people become more and more disillusioned with their leadership. Everybody needs to be able to dream of a better future. When we rob people of hope, we rob them of their humanity. The real challenge now is how to incentivize the people of Gaza, so they have something to invest in for their future. The Gaza Strip measures 140 square miles: driving its full length takes approximately one hour and fifteen minutes, and the walk from the sea to the border fence is around two hours. It is a very small, overcrowded piece of land with a population of 2 million people. The basic dynamics for Gaza's long-suffering inhabitants have remained unchanged for years. Israel’s policy towards Gaza has historically been one of punishing the population for electing a Hamas government, hoping their suffering would force people to overthrow Hamas. This is not how it works psychologically; this approach has held Hamas in power not weakened it - a decade later Hamas remains in charge. Investing in Gaza and improving the conditions is more likely to weaken extreme political movements. Several weeks ago, Hamas conveyed a proposal calling for a long-term truce with Israel through Egyptian and Qatari channels, but Israel paid scant attention. Hamas wanted to avoid another round of war, but felt it was in its strategic interest to escalate the non-violent protests on Israel’s border. The aim was to focus the attention of the media and politicians, in a bid to force Israel to the negotiating table. Recently the Hamas leader in Gaza, Yahya Sinwar, said his party had reached an agreement with Egypt on preventing an escalation of the violence into an all-out military clash with Israel. Israel controls all access to Gaza by sea and air and it continues to place severe restrictions on goods and persons entering and exiting Gaza through the land crossings. It has now been reported that the Israeli prime minister has made a strategic decision to achieve a stable cease-fire in Gaza, and that Israel has given Egyptian and Qatari mediators the green light to deliver the goods. Israel harbours intense anxieties about the regeneration of Gaza and what it could mean for Israeli security. It is concerned that improving conditions in Gaza, particularly economic, would open up opportunities for Hamas to gain strength. No longer forestalled by rigid blockades and the costs of war, Israel perceives the risk that Hamas could become as strong as Hezbollah, increase its weapons cache and continue to build tunnels into Israeli territory. The Egyptian military leadership is actively trying to promote reconciliation between Hamas and Fatah, expand the Palestinian Authority’s role in the Gaza Strip, and initiate economic relief. Unity is a prerequisite for developing a new national platform and strategy, the divide between Fatah and Hamas debilitates their ability to advance their political aspirations. President Abbas is not in good health and has told Egyptian mediators that the Palestinian authority will only return to rule Gaza, if Hamas hands over all powers, including control of weapons. A unified Palestine would strengthen its negotiating hand, allowing the government to speak for all Palestinians and would give them more leverage to push for an independent state. Amongst Palestinians there is much cynicism about the prospects of reconciliation given the history of false dawns and six failed reconciliation attempts. Whilst reconciliation is a political imperative, improving the conditions in Gaza is also a necessary prerequisite for any serious peace making. There are immediate and more long-term considerations, in the immediate the banking system is collapsing. This has been recently exacerbated by the Palestinian authority no longer paying the salaries to 100,000 Gazan civil servants which affects the livelihood of over 800,000 Gazan families. This withdrawal of money out of the economy requires cash injection immediately, and historically this has beed done by Qatar. There have been discussions about the possibility of allowing the transfer of raw materials, food and goods, and materials for road and house building, and more long-term projects such as the the construction of a dedicated Gaza port facility. There have been some voices in Israel who recognize that the regeneration of Gaza is essential, but up until now , none of this has been given serious consideration. There is little support in the Knesset or in the current Israeli government, international pressure will therefore be required if anything sustainable is to be implemented. In 1998 Gaza’s Yasser Arafat International Airport was opened, only to be bombed by Israel four years later. A comprehensive regeneration strategy could consider rebuilding this airport. Gas has been discovered in Gaza’s coastal shelf and partnerships could be established to tap into these reserves. Desalination and sewage recycling equipment would also be an essential part of any development offered. This economic regeneration can only be meaningfully explored in the light of a long-term ceasefire between Hamas and Israel that makes this investment in Gaza sustainable. A trusted ‘third-party’ is needed, who can work directly with the parties to try and enhance the conditions for constructive negotiations. If the people of Gaza are to believe in a future, preventing them from being drawn into nihilistic violence, will require serious political engagement. It is not only the responsibility of Israel; the international community turns its back on Gaza once fighting subsides. In the aftermath of the 2014 Gaza war, despite 2,000 Palestinian deaths, there was no lasting international engagement or strategy. The attention deficit on Gaza will needs to be addressed and will require the implementation of a serious plan. If the UK could move beyond its Brexit preoccupations, it could put serious time and energy and take a leading role in working with others, to create and implement a comprehensive plan. It cannot be beyond our imagination to make this possible.